I recently won a gift certificate to The Craft Barn from a challenge over at The Cuttlebug Spot and I knew that I wanted to get a Motivet stamp. 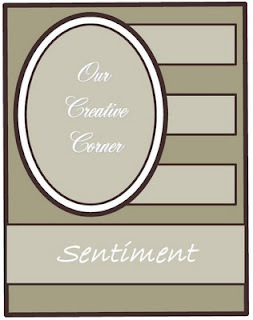 I just recently came across this company and I immediately fell in love with their adorable images. I decided to get Doraline - Surprise! 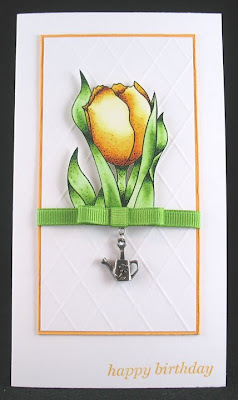 and I received her just in time to make a card for the Motivet sketch challenge. I colored the entire image with Copics, then sponged the outer edges with yellow ink. 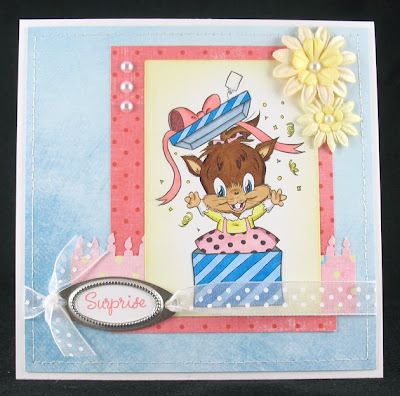 The light pink layer was punched with the EK Success candles slim edger punch and the Surprise sentiment is from The Greeting Farm's Happy Chef set. I hope you like it and TFL! Other materials used: patterned paper - Fancy Pants; flowers - Prima; ribbon - May Arts; pearls - MimiLolo Etsy store; metal bookplate - Stampin' Up! ; long rectangle Nestabilities. I'm a big dog lover (we've got 3 of them) so I was really happy to be able to play with this image! The image actually only has 1 dog, but I wanted 2, so I printed out a larger version and a smaller version to get 2 different sized dogs. I colored everything with Copics, cut out all the different parts, and popped them up with foam tape. 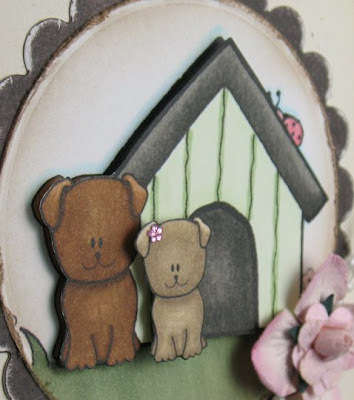 I popped up the little ladybug with a couple bits of cardstock, then the whole house with the bigger dog, and finally the little dog. You can also see that I added a tiny flower rhinestone to the girl dog. This week's Design Element was distressing, so I ran my scissors over the edge of the plain circle, sanded the scalloped circle, and did some sponging on the plain circle and the card base. 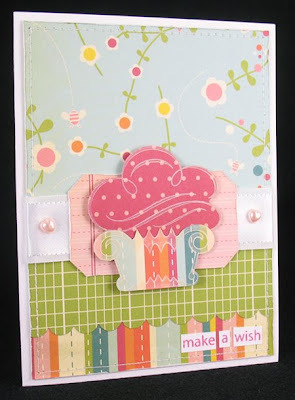 And I also made this card for the Cupcake Craft Challenge 50 - use the colors green, pink, and brown, and animals and flowers. I decided to play because Softpencil is actually sponsoring this week's challenge, so definitely check it out if you'd like to win a $20 voucher to the Softpencil Etsy shop! 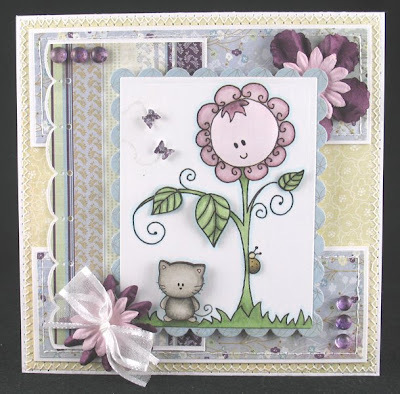 Other materials used: circle and scalloped circle Nestabilities; alpha stickers - Making Memories; hydrangea flower - Prima; rose - Paper Wishes; pearl strands from stash. 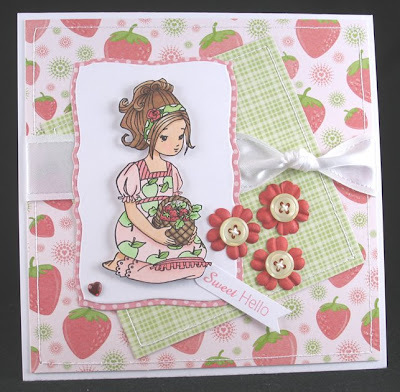 Today's card uses the same Whiff of Joy image that I used before, Willow with Strawberry Basket. 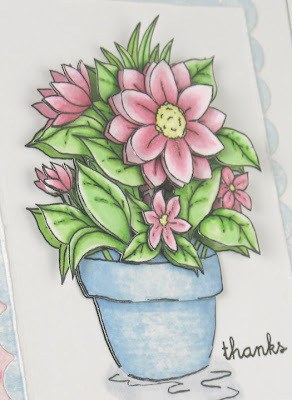 I know I need to use the other images from the Summer Stamp Kit, but this is hands down my fave and I couldn't resist using her again! 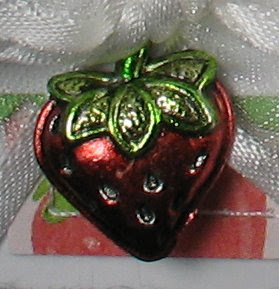 Not much to say except that she was colored with Copics, as was the plain silver strawberry charm. I experimented first on the back of a charm and was thrilled when it took the color so well! 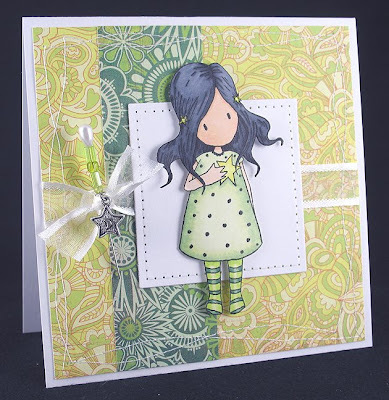 Other materials used: sentiment - Whiff of Joy; patterned paper - DCWV Nana's Nursery Baby Girl; Berry Sorbet buttons and ink - Papertrey Ink; Green Galore cardstock - Stampin' Up! 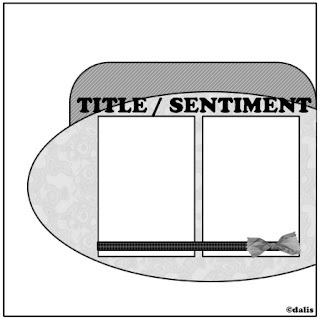 ; ribbon - local craft store, petite oval, petite scalloped oval, and long scalloped rectangle Nestabilities. I printed the pot area twice on blue patterned paper, then shaded with a Copic and layered using scrap cardstock to pop it up. The rest was colored with Copics and I added some Stardust glitter pen to the open flowers. I did a LOT of paper tole to give the image tons of dimension using a combination of cardstock punches and foam tape to pop up the parts. Because I wanted to keep the focus on the image, I kept the card base really simple. I added a scalloped mat and a bit of patterned paper punched with a Martha Stewart border punch and embellished with half pearls. I also free handed the little border (it looks totally hand drawn, but I think it's fun!) and stamped a tiny sentiment. Unfortunately, because of all the shaping, it was impossible to get a really good shot of all the glitter! And I also used the colorless blender all over to highlight and soften edges. 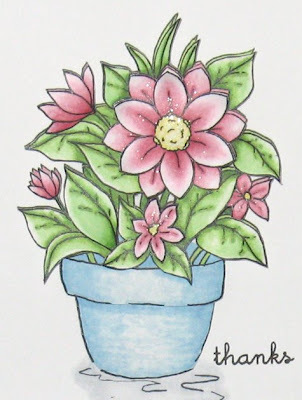 This card is also for the Copic Creations Challenge #8 - Botanicals. 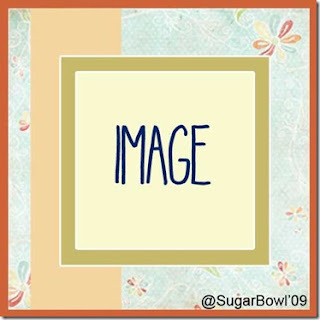 I had so much fun playing with this image - a big thanks to Tracey for this fab freebie! Other materials used: patterned paper - Fancy Pants (Key Lime collection); sentiment (Mega Mixed Messages set) - Papertrey Ink; Nestabilities; half pearls - MimiLolo Etsy store. The sketch was for a square card, but since I've been making a lot of square cards lately, I decided to stretch it to make an A2. Gretel was colored entirely with Copics and I did my Stardust/waterbrush technique on her wing. Then I cut her out and popped her up on foam tape. I added tiny half pearls for her ponytail holder and the button on her dress. 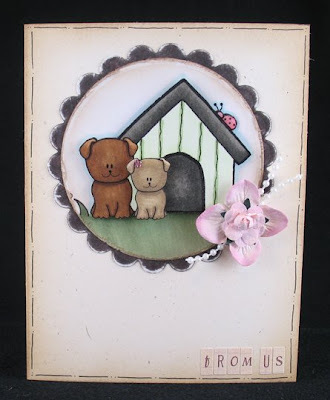 Other materials used: sentiment (Mega Mixed Messages set), kraft cardstock and Fresh Snow ink- Papertrey Ink; Certainly Celery, Chocolate Chip, and Perfect Plum cardstock - Stampin' Up! 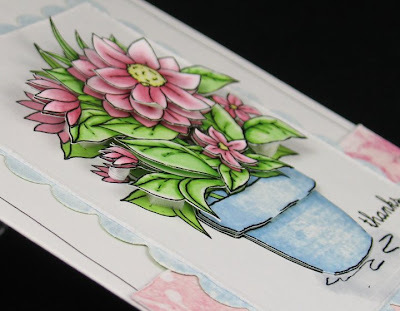 ; flowers - Prima; heart charm - Blue Moon Beads; ribbon - May Arts; Copic markers; tiny pearls - MimiLolo Etsy store; brad - Pink Hedgehog Papercrafts; Labels One Nestabilities - Spellbinders; Perfect Paisley and Swiss Dot embossing folders - Provo Craft. I paper pieced the umbrella with 2 different patterns, her little hair bow, her shirt, her pants, and I even printed the entire image on patterned paper to give it a cool blue swirly background. I colored the raindrops, puddle, her hair and skin with Copics, then went over all the water with a Stardust glitter pen for sparkle. I cut out and popped up the umbrella top, the entire girl and an extra hair bow for dimension. I also added micro half pearls to the umbrella and her hair bow. Secret Crafter - Spots and Stripes. I used striped paper and spotted ribbon. BTW - I used the sentiment "Enjoy the moment" because I thought it looked like she was splashing in the puddle for fun! I hope you like it and TFL! Materials used: sentiment (Mixed Messages set) and button - Papertrey Ink (Mixed Messages set); patterned paper - Daisy Bucket; turquoise cardstock - Bazzill; Rose Red ink - Stampin' Up! 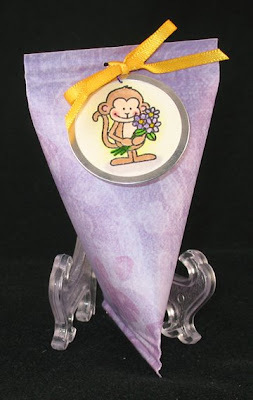 ; ribbon - May Arts; rectangle and scalloped rectangle Nestabilities - Spellbinders. 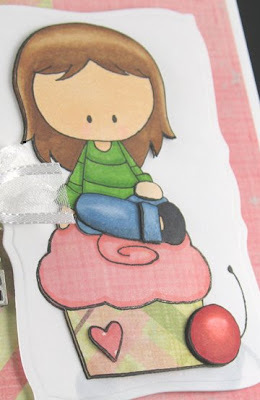 I'm a big swirl lover, so this image from the Thanks With Style set is one of my faves from Kitchen Sink Stamps. I turned the sketch on its side and enlarged the focal panel a lot to accomodate this large image. I added some micro half pearls and did a bunch of distressing to all the edges. Hmmm... looking a bit more closely at the sketch, I can see that I kind of messed it up a bit! If I have more time before the deadline, I'll have to try another entry! Anyway, I hope you like it and TFL! 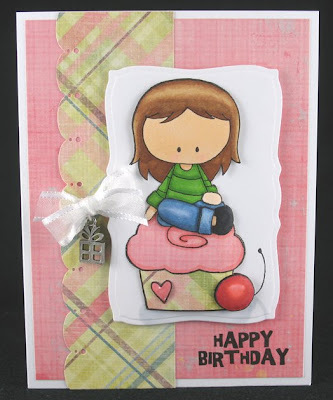 I used the Happy Birthday Cupcake set from Kitchen Sink Stamps for both the cupcake and sentiment. The papers are all Cosmo Cricket Girl Friday and the little heart pearls are from an Etsy seller. I hope you like it and TFL! 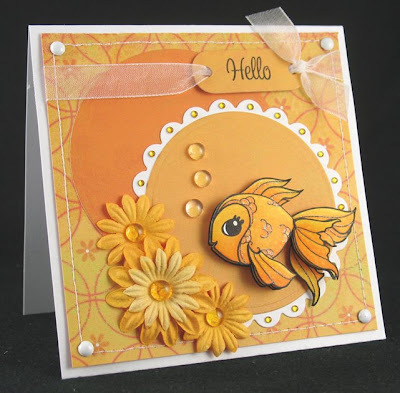 This week at Pile It On, the theme is Mostly Orange and our sponsor is Whimsy Stamps, who was so generous to send us images to work with. I got the cute Narwhal Whale. 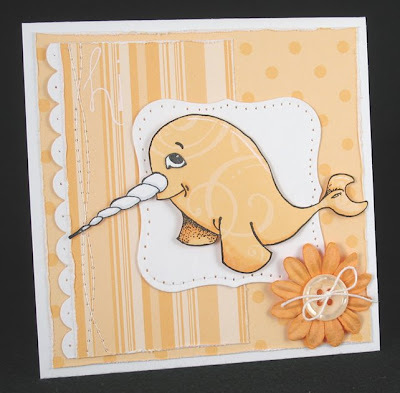 At first I wasn't sure how to incorporate a whale into the orange color scheme, but then I thought the company name is Whimsy... so I decided to do an orange paper pieced whale! 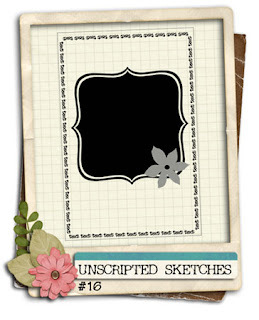 I had a really old pad of patterned paper from Stampin' Up! 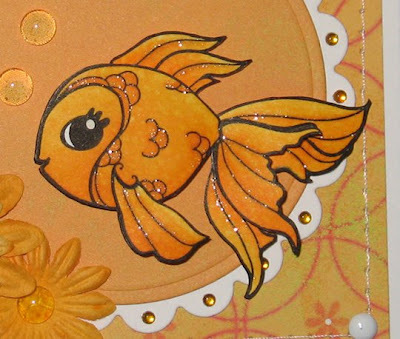 with a bunch of different patterns in this really pretty soft orange color so I used a few different sheets for this card. I stamped the whale onto the swirly PP and also onto white cardstock for the eye and horn. The whale is popped up with foam tape and I also did a little shading with Copic markers and highlighting with an Inkssentials gel pen. Pile It On - Mostly Orange and combine with at least one other challenge. Stamp n' Scrap Hawaii - sketch (it's their very first challenge so be sure to go check them out!) Another requirement of the challenge is to answer their trivia question which is "What is the Area Code for Hawaii?" I'm going to take a wild guess here (lol!) and say 808. 365 Cards - Try a Technique (paper piercing). Paper Blooms - Animal Fun (this is my second entry). I hope you like my orange whale and TFL! 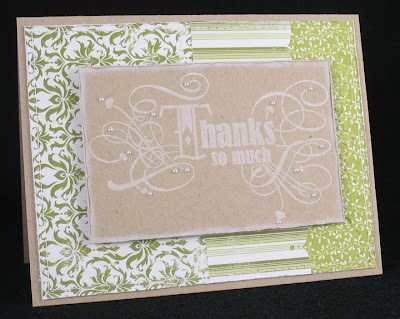 Other materials used: scallop border punch - Stampin' Up! 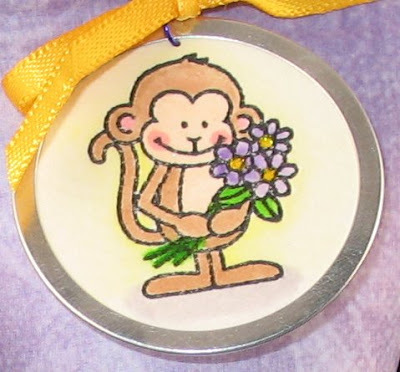 ; flower - Prima; button - Papertrey Ink; Labels One Nestabilities - Spellbinders; Heidi rub on alphas - Making Memories; crochet thread; sewing thread. 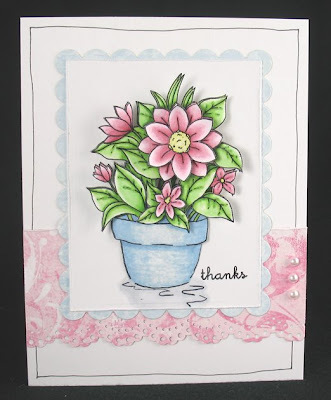 ETA: This card got me picked as the very first featured artist at Paper Blooms!! Woohoo! Check it out! 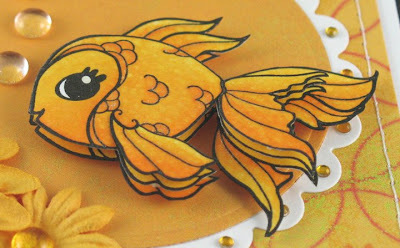 I stamped and colored the goldfish 3 times and then cut out and popped up the pieces with foam tape. You don't need to color all the layers, but sometimes I do anyway so there won't be white parts showing underneath the layer edges. After coloring, I dotted the fish with my colorless blender to make spots that look like scales. I didn't do the face though because I thought it might look creepy. Other materials used: sentiment - The Greeting Farm (Wonderland set); patterned papers - My Mind's Eye; flowers - Prima; clear Dew Drops - Robin's Nest; orange Bella's Baubles - Stamping Bella; plain and scalloped circles Nestabilities - Spellbinders; Cuttlebug tag die - Provo Craft; brads and ribbon - Pink Hedgehog Paper Crafts; rhinestones - eBay seller. 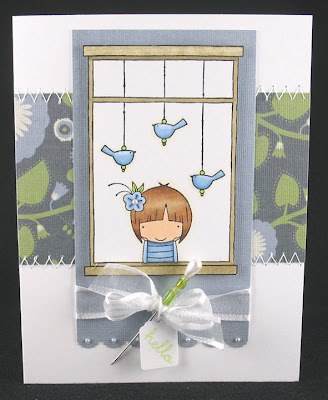 For today's Softpencil card, I used the most adorable image called "I will keep you safe Michu." 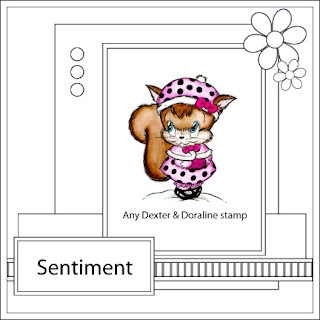 There are different versions of this stamp (hop around to the other DT blogs and you'll see them! ), but I got the Michu version because I'm such a huge fan! This week our Design Element challenge was to add stitching (hand, machine, or faux) to our project, so I did a zigzag and straight stitch on the outside, and a little more straight stitching on the inside. I colored the image with Copics and popped up pieces for dimension - Michu and an extra Michu head, the flower face, all the leaves and the little ladybug, which I colored to look like a snail because red didn't go with my color scheme. I also added Stardust glitter pen to the flower petals, leaves, and snail shell and a couple punched butterflies to fill the big white space. I found this stamp in Papertrey's Out On A Limb set and thought it was absolutely perfect with this image. It says, "To the world you may be just one person, but to one person you may be the world. Josephine Billings". 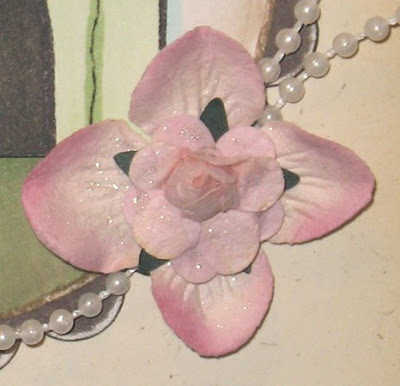 I got the idea for the three-pearl flower center from my fellow Pile It On DT member Alecia. Thanks Alecia - I really love the way it looks!! Other materials used: patterned paper - Basic Grey (Wisteria); flowers - Prima; Dew Drops - Robin's Nest; ribbon - May Arts; rectangle and scalloped rectangle Nestabilities and Labels 4 - Spellbinders; border punch - Martha Stewart; buttefly hand punch - Fiskars; Cuttlebug embossing border (Frills) - Provo Craft; little half pearls - MimiLolo etsy store. Today's card was made for only one challenge (can you believe it? lol!) - the Copic Colour Challenge. I wasn't aware of this blog so I'm really glad I stumbled onto it because I love my Copics! All Copic colors used: skin - E00, RV10; hair - E53, E33,E35, E37; shirt, birds, flower - B41, B45, YG03; window frame - Y28. Other materials used: sentiment (Mega Mixed Messages) - Papertrey Ink; tag - Quickutz; border punch - EK Success; ribbon - May Arts; beads - Dress It Up; pearl pin - local craft store; micro half pearls - eBay. 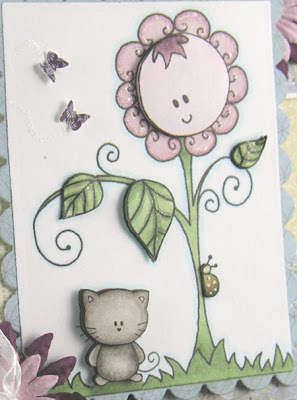 It's also for Paper Bloom's Shape Up Challenge, which is to make a shaped card. In case you can't tell, the top of the cupcake is supposed to be a little island and the bottom is the ocean. Yes, that's real sand on the top! I cut the cupcake and the tree with my Cricut using the Doodlecharms cartridge. I was going to use the penguin stamps, but they were a little too big for my cupcake so I cut these out of a sheet of patterned paper and they're just the right size! 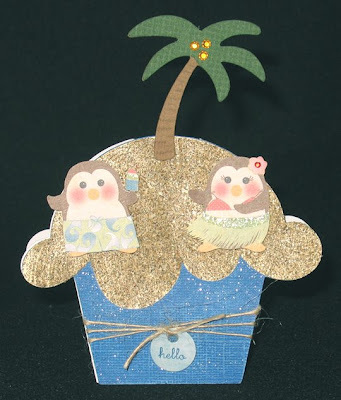 I added some Stardust sparkle to the "ocean" and little rhinestones for the coconuts and on the flower. Other materials used: blue cardstock - Core'dinations; green and brown cardstock - Bazzill; twine and sentiment (Mixed Messages set) - Papertrey Ink; Brilliant Blue ink - Stampin' Up! ; tag - Cuttlebug. 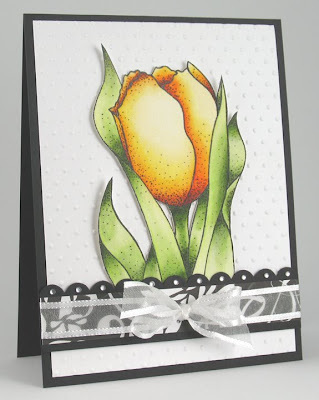 This week I got to work with a gorgeous tulip image from Softpencil - Digital Stamps. I was a little intimidated when I first saw it because I'm not a great colorer. However once I actually sat down and tried, it was pretty easy to follow the stippling to know where to put the darker colors. I had so much fun with the first one that I had to do a second! For both cards, I really wanted the focus to be on the image, so I kept them pretty simple. I can't remember exactly, but I believe I used about 4-5 yellow/orange tones, and 3-4 green tones. I'm working on my coloring techniques so this was a great image to practice on! After I colored the image, I cut it out and popped it up with foam tape, leaving just a little extra white space at the bottom without foam tape to fit under the ribbon. The bow is just a loop with a little extra bit taped around the middle and glued on to the piece of flat ribbon. The diamond pattern was created on the Scor-Pal. I'm a little obsessed with charms right now so you'll be seeing more on my cards as I acquire them! This week the DT was given a Decorative Element challenge which was to use a specific color theme - yellow/orange, so that's why I colored them both with the same colors. My regular watercolor paper was too thick to go through my printer, so I ran a Fabriano notecard through and it went just fine. After I watercolored, I cut it out just like the first one, but I didn't use any foam tape this time. However I did leave parts free from glue so the image would still be dimensional. Well, that's all for now. I hope I did ok with my coloring and that you like the cards. TFL! Other materials used: Summer Sunrise cardstock and ink, Simple Little Things Limited Edition stamp set - Papertrey Ink; black cardstock, scallop border punch, and green ribbon - Stampin' Up! 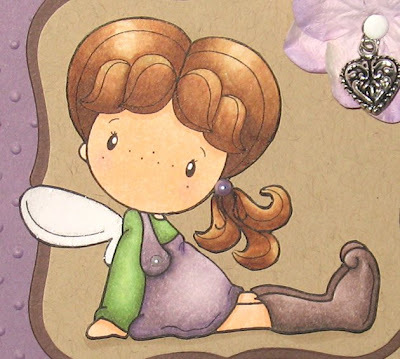 ; patterned paper - Creative Imaginations; white ribbon - May Arts; Swiss Dots embossing folder; tiny rhinestones from ebay seller; charm from stash. 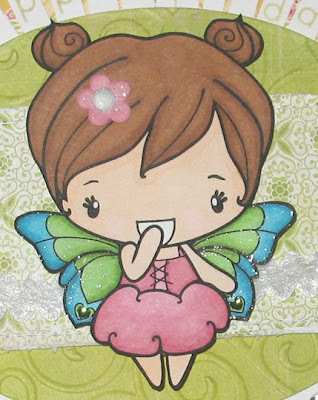 Quick notes: She was colored with Copics, cut out and popped up with foam tape. For the panel she's on, since there is no exact matting size in that style of Nestie, I cut the white panel on the embossed line to make it just a smidge smaller and then matted it with the dotted panel cut with the same Nestie (hope that makes sense!). For her hair I used E53, E33, E35 and E37 (I use E53 instead of E31 because I think it's a better match to the other colors). Whew! 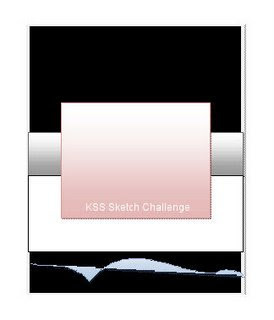 7 challenges! I hope you like it and TFL! 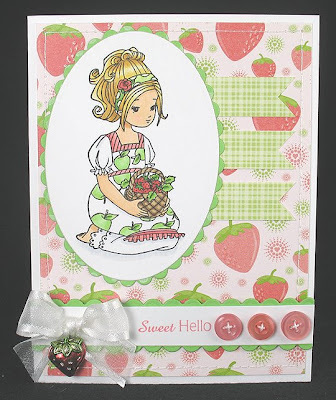 Other materials used: Sweet Hello sentiment - Whiff of Joy; patterned paper - DCWV Nana's Nursery - Baby Girl; Berry Sorbet ink and Spring Moss buttons - Papertrey Ink; Prima flowers; May Arts ribbon; heart rhinestone - Queen & Co.; Nestabilities. Finished size is 5.5" square. I got picked for the Pile It On Design Team!! Each Sunday we will give you a challenge. We would like you to incorporate our challenge with at least one other CURRENT challenge (at the time of posting) to "qualify" to be one of our Three Top Scoops or should there be a prize offered that week. The PIO blog has tons of challenge sites listed so it's not hard at all to find challenges to combine with the PIO challenge! I think it's lots of fun and I hope to see you all playing along with us! 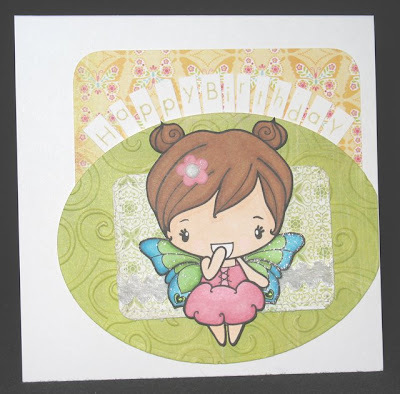 The layout was CASE'd from a card in the latest Doodlebug ad with just a few minor changes. I hope you like it and TFL! 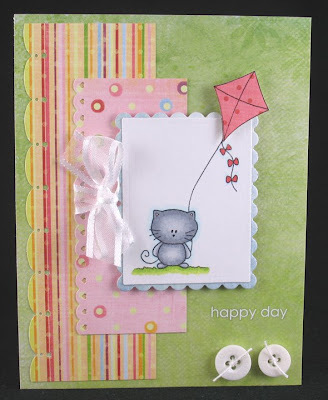 Materials used: patterned paper - Fancy Pants; butterfly and thanks diecuts - Quickutz; border punch - EK Success; circle and scalloped circle Nestabilities; brads - Pink Hedgehog Paper Crafts. I colored Michu, the ground, and the kite tail with Copics, and paper pieced the main part of the kite, which was also popped up with foam tape. 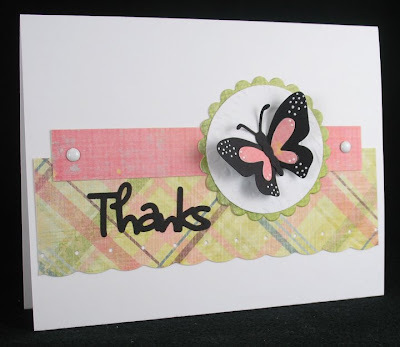 Other materials used: patterned paper - Fancy Pants; border punches - Martha Stewart; rub on sentiment - Stampin' Up! 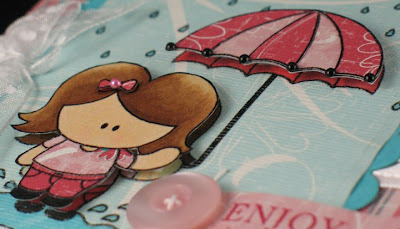 ; buttons - Making Memories; ribbon - May Arts.